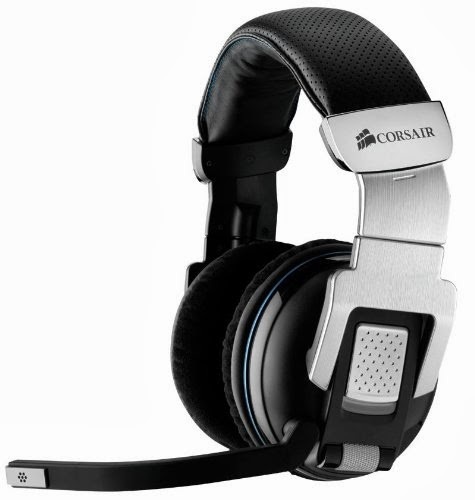 The Corsair Vengeance 2000 Wireless 7.1 Gaming headset ($149.99 shipped) is the first wireless audio product to be released by Corsair. 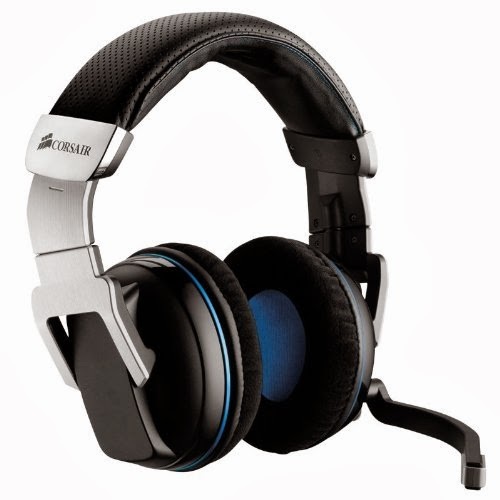 These headphones were designed from the ground up as a wireless solution that was able to give gamers the detailed positional audio, reliable voice communication, and comfort that is required for intense gaming sessions. 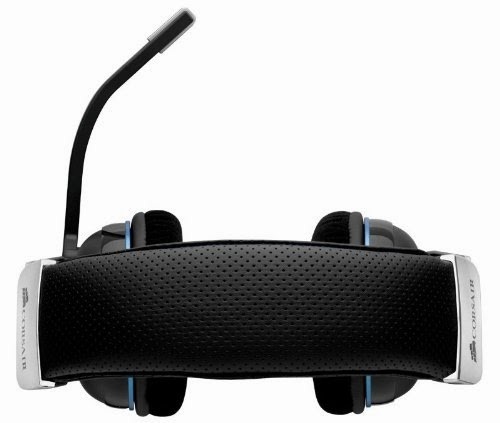 With a wireless gaming headset there is no cable to roll over or get tangled up on your desk. They also have a range of 40 feet, so you can get up and come back without having to take them off. We all know how frustrating wired headsets can be at times and for some the extra price of a wireless headset is more than justified to keep infuriating times to a minimum. The Vengeance has a bulky look to it, especially compared to Razer Carcharius. It has a faux aluminium frame, black plasic cups with an added blue line, and a generic headband. It does look quite solid, but certainly not stylish. The hipster crowd should (and probably will) look elsewhere. As bulky as it looks, it's just shy of feeling entirely solid. In a company of (wired and wireless) headsets, it has little to be ashamed of, even though e.g. the (wired) Sennheiser PC 350 has a much more rigid and therefor solid feel. Overall, it feels solid enough that I think it will last for a couple of years at least, but as it's entirely made of plastic, it does require handling with care. Throwing these around or dropping them would not be a good idea. To be honest, I would prefer something more solid, but that would mean added weight, which might make it too bulky. With the big cups and memory foam, the Vengeance is very comfortable to wear for long times. The headband is nicely padded as well. Compared to the Carcharius, it's both more and less noticable on head. More, because it's quite a lot heavier, and less because of the snug fit and padding. The weight might bother some people. Ears do get a little warm after extended use because the Vengeance sits very snugly. The Vengeance has a detailed, airy sound, with great stereo imaging, solid but not boomy or artificial lows and slightly splashy highs. Much of this is probably due to the 50mm drivers and acoustic tuning of the set. It revealed some details I hadn't noticed before in very quiet ambient tracks, delivered great bass on dubstep. Because of the slightly splashy highs, I tend to roll off some of the higher frequencies when listening to harsher electronic music, specifically anything distorted. The Vengeance sounds a lot better all-round than the Razer Carcharius, somewhat less up-front than the Sennheiser PC 350, more defined and punchy than my AKG K-240 and certainly not as detailed and solid as the Ultrasone HFI-580. It's not that far off from the Beyerdynamics DT-series in perceived quality, even though those are a lot more comfortable. Overall, the Vengeance music performance is good. As a PC headset, gaming is of course the intended use of the Vengeance 2000. As expected after reading what they set out to do, the Vengeance's audio performance in games is a thing of beauty. Battlefield 3 tank battles reveal its tight bass response without any of the artificial 'enhancement' other headsets tend to confuse with the real deal. Thanks to its excellent stereo imaging, directional cues in close combat are extremely effective, both in Battlefield 3 and in Left 4 Dead. Overall, it passed anything I could throw at it gaming-wise with flying colors. Down-mixed surround tracks from TV series and movies sounded great. Doing some chores with a movie playing and these on was a boon. For late-night movie watching, these are perfect. The quality of the microphone is excellent. Voice comes through strong and responds very well to noise reduction options. The auto-mute when rotating the mic upwards works perfectly and is very handy. Download the latest driver from the Corsair site to get a solid performance. It's quick and easy to switch from and to the headset from another audio interface. Set up the UBS dongle, charge the headset, press its power button for 1-2 seconds, and the headset gets picked up by the dongle almost immediately. Couldn't be easier. It has an on/off button . The only other control is a volume bar on the left cup, which has a very solid travel and is great in use. The headset needs a recharge after about five or six hours (rough estimate) of use, which is satisfactory. It can also be charged while in use, which is great. Like every other headphone solution I tried I find the virtual surround sounds unnatural and unpleasant. It does succeed in giving rear speaker sounds a bit of direction, but the boxy quality it lends to everything is unacceptable. I turned it off after ten minutes and wouldn't recommend this or any other current headset (wired or wireless) to replace even a sub-par set of 5.1 speakers. 11. Wireless connection: You will have some drop-outs when walking out of the room where the transmitter is, but that's entirely expected. At any reasonable range, the wireless connection is rock-solid. The Vengeance 2000 is a very satisfying headset with a rock-solid wireless connection that doesn't seem detrimental to the sound. The build quality is above average, the sound quality is a lot better than I expected and it's very easy to use. The price might be a bit high for the average consumer, but won't strike an enthusiast as excessive.